I have decided that paying for blogging isn't a good choice right now. I am returning to blogger where I used to blog for free. I'll leave this up for awhile for pointers and bookmarks to be changed but my new posts will be available at . . . The funny thing was that Ruthie was very self-conscious while performing. In the car, she was totally unaffected. It has never occurred to her that she might forget the words or the melody to her songs. She just gets up and sings. But, she does sing quietly in front of a crowd. As you can see, the first round of applause warmed her up nicely though. Her first song was the very difficult "America the Beautiful." She loves it and also chose it for the talent show at our school. She sang it very quietly tonight -- a surprise for those of us who know and love her! 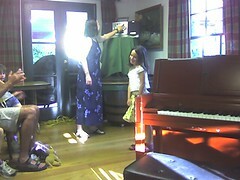 :) Then she sang Do Re Mi (from the Sound of Music). She did a more lively version of that too but you could tell she was very self-conscious. Not nervous. Not stage-fright or anything like that -- just aware that the audience was there. Interesting, to say the least. Greg got video on his cellphone of the entire Do Re Mi number. It's just that he doesn't know how to get it off his cell phone. So, if you see him, ask to see it. Otherwise . . . who knows! For me, it was a fantastic moment. Gage sat on my lap and was intrigued by the guitar playing boy who sang along. Very cool. Maybe next year, I'll be watching two kids play!!! Well, I've just been swamped lately. Summer School keeps me busy and I'm obsessed with the 4/5 Combo job at BCE. I can't think of anything else but it's time to think of other things, for sure!!! I've got SO much school work to do and I've hardly even thought about it in weeks. This weekend, one of my goals is to get it all out and organized again so I can make progress! I've got limited time!!! We're going to do a dump run this weekend. We're having some guys come in and clear all the weeds, branches, and debris out of our backyard. Hurrah! Then we can get started on some actual landscaping. Amazing! Greg is really awesome when he gets a goal in mind! This weekend is 4th of July (4 day weekend for me -- hopefully I'll get my head together this weekend). Then, the next weekend, I take the kids to Carson City to spend a week with Mom and Igor. Wow! Wild times! So, that's a quick update from the Edge. Left Friday after school and headed off to San Simeon State Park down near Hearst Castle on the coast. The drive down wasn't as hot as we'd expected -- thankfully. I was praying for fog and it was foggy. Perfect weather as far as I was concerned. Foggy evenings and nights and sunny but coolish days. Wonderful! We had a great time although there were some major SNAFUs. For one thing, we had a flat tire on the 5th Wheel. The good news was that it wasn't until we parked that it went flat so that was nice. We ran over some piece of metal. We hit an auto parts store and got some tire inflator stuff, sealant, and a 12 volt air pump. Worked great. The other major SNAFU was that I forgot when Greg's birthday was. I thought it was on Sunday so I thought I was ahead of the game when we started celebrating on Saturday afternoon -- of course, it was ON Saturday. Poor guy! Sigh. He took it well and seemed to enjoy the Martinis I made him as well as the great skirt steak we had for dinner. I drove most of the way home yesterday to give him a break and I bbqed at his parents as his dad didn't want to and seemed to think Greg should anyway. Bob would have but I was being slightly martyred at that point. Probably the most fun thing we did on the camping trip was go to the beach. I normally hate the beach and avoid going but I had fun once we were there. It's a very rocky beach -- and you can rock hound there. Greg and the kids built a fort that we defended from the encrouching tide. That was fun. We had fun doing that. Gage and Ruth had a blast in the water -- challenging the waves, running in and letting the waves come around their ankles. The water was freezing but we had a so much fun! We took a drive up a really pretty canyon after that. So beautiful. We could totally imagine buying 5 acres there and setting up a place to park our RV and vacation there whenever we wanted to. Pipedream but a fun one. We love that area so much. My favorite thing to see down there is a gorgeous old farm between Harmony and Cambria. Gorgeous old farm house and barn. They raise Longhorn there which is totally fun. It's lovely. I saw tons of birds. Most notable were Great Egrets -- probably saw a dozen on the trip. Also saw lots of Red-tailed Hawks, Turkey Vultures, Black Vultures. Saw a bunch of crows at the campground. Delightful birds. Lots of swallows at the campground too. Saw a bunch of Brown Pelicans flying around -- one group flew right over us. Greg said, "Please don't poop!" which delighted the kids to no end. And, thankfully, they didn't poop! Whew! We're exhausted but it was fun. I got a bad sunburn on my left shoulder (driving in a tank top). Just finished peeling from the Great America burn and I got a new one. Lovely. What a sun dork I am. Nothing new on the job front. Just waiting to hear about an interview for the 4/5 Combo job. Fingers crossed. Summer School continues. I don't love it or hate it. It just is. Some of the kids are great and some make me nuts. I will survive. Things are looking up again for a job at my school again next year. Fingers crossed everyone! Okay, so I've been busy! At any rate, here's what's been going on. That day of packing up at school was nightmarish! Miscommunication resulted in people expecting to shampoo my carpet before I knew I needed to be out. Not pretty. Of course I wish I'd handled it all with more grace but it all worked out eventually. My boss apologized at the end for rushing me out and let me know that it doesn't look good for a job for next year. That's sad. Really sad. There are jobs at SLE though so I have my fingers crossed! Since then, I've been relaxing (although I'm still not done with my responsibilities!). Crafty Chix was awesome. I made an adorable felt bunny! Soooooo cute! We did Great America for Father's Day. Totally fun, wet, and sunburny (for me, anyway). That night, Gage woke up twice with his ears hurting bad. So, I got almost nothing done yesterday, damn it all. Gotta to email K and let her know I have to change my appointment today for checking out and being done. So, today, I have my Summer School staff meeting. Wonder how that's going to go. I went through all the stuff last night that P and I put together and there is a lot missing. Damn. Hopefully I can get over there today and get some of it back. Weirdness. So, that mostly catches us up. I miss Mom being here -- it was sooooo nice. We rarely seem to have TIME together and we did that this time. She'll be back for a long visit when she brings the kids back. Hopefully, that will be super nice too. Of course not the work and not the stress but that's another story. I'm hanging in there -- I had a good and bad last day of school yesterday. But, nothing major. Just lots of stress. Got my period yesterday (what timing!). Having terrible sinus problems -- allergies. Need to take 2 Claritin-Ds a day to make it. Forgot last night and woke up with a TERRIBLE headache. Blech! Off to school to pack up my classroom and get DONE. Lots and lots to do there. Bleh. Mom is here and that helps a LOT. She's a god-send! She showed up in my classroom yesterday at EXACTLY the right time. More later when my brain is engaged and not throbbing with pain. Still no word on a job for next year and I know that's NOT helping. :( Still, keep it positive! Nothing good comes easy! On the good side. . . wow! The kids got AWESOME report cards. Super cool! So proud. 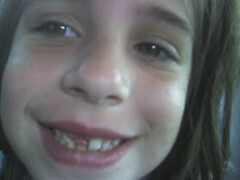 Ruthie lost her big front tooth this weekend. She looks so adorable. She'd been working on it for AGES and finally just got determined and yanked it out. The blood kinda freaked her but she took her cue from us and was proud of herself. Gage, AKA SharkBoy, is growing a 2nd row of teeth. 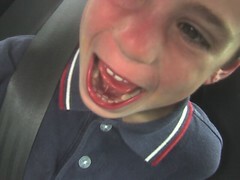 The dentist tells us not to worry yet but if they don't get significantly loose soon, he'll need them yanked. Oh Boy! Last night was a teary, happy night for me. It was the Kindergarten Completion Ceremony for Gage. The teachers -- whom I adore -- are an evil lot bent on making mothers as weepy as possible. Terrible women. :) They had the kids sing wonderful songs. They had a slide show of all kinds of pictures set to sentimental music about transitions and changes and the amazing power of small children. Weep. Weep. Weep. Then we headed outside and the kids all shared a wish for the world -- to make it a better place and they released balloons into the world. One for each class. It was awesome. The kids watched and watched until the balloons disappeared into the sky. Amazing. After that, we went out to dinner with my inlaws (thanks again!!!). We hit the local brewery and had a much too late dinner but it was great. The kids were good. The room was loud. The food was slow but good. Transitions. Hard. Amazing -- looking ahead to the future. Looking behind at the past. I can't believe that I won't ever have a kindergartener again. Sniffle.